Colorado scenic byways are a great way to explore a new area, see the best scenery, and learn some history. There are two scenic byways that cross through the San Luis Valley. They are the Silver Thread and Los Caminos Antiguos byways. These two byways do a great job of covering most of the San Luis Valley floor and showing unique history along the way. 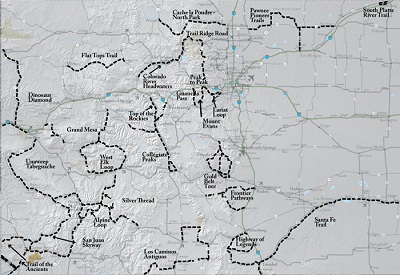 The Colorado Scenic and Historic Byways program is a statewide partnership which provides recreational, educational, and economic benefits to Coloradans and visitors. These byways provide outstanding touring routes throughout Colorado and give the travelers an inside look at the state’s magnificent views and history. Scenic and Historic Byways are designated by the Colorado Scenic and Historic Byways Commission for their exceptional scenic, historic, cultural, recreational, and natural features. There are 25 byways throughout all of Colorado. Have you driven on any of these 25 Colorado Scenic Byways? Click here to share about your scenic drive. There is also the National Scenic Byways Program (NSB) that was established in 1991. The roads are classified as National Scenic Byways or All-American Roads based on several qualities. There are 150 byways located across the United States. This historic byway takes you through colorful old mining camps and scenic beauty as you travel from South Fork to Gunnison, Colorado. This route takes about 3 hours to drive and is 117 miles. During your drive you will pass through the historic towns of Lake City and Creede which were once booming mine towns and pass the beautiful North Clear Creek Falls. This is the scenic and historic byway of Hispanic Colorado which covers 129 miles and takes about 3 hours to drive. It passes by the Great Sand Dunes, Colorado’s oldest town and church, and one of Colorado’s first military posts. With lots of open, natural space that is still undeveloped it would seem that the area hasn’t changed much since the 1600s when Spain claimed this region. Take a day to drive this tour and see some of the oldest history in Colorado. 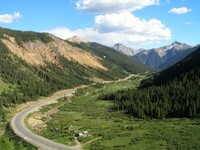 Driven A Colorado Scenic Byway? Have you been on any of the 25 scenic byways located throughout Colorado?